San Diego – Not Visited (for a game — somehow I got to visit for a Little League assistant coach “training event”; it was colder than expected). So something to work on then. Could still hit the Bucs in NY and Cincinnati this year and the Mariners still have road trips to NY and Toronto. Maybe. Zombies. Their day in the sun should have ended with Shaun of the Dead, which came out in 2004. The zombies’ 15 minutes are up. Adding the word “apocalypse” does not grant the zombie idea any new freshness. “Bacon” as a topic of discussion. Eating bacon is still fine. It’s also no longer interesting to put bacon in places where it doesn’t belong, e.g., in milk shakes or other dessert foods. The word “awkward” as a punchline. If you’re not sure whether your firm is hooked up with a competent advertising agency, any pitches that include TV spots where “awkward” is used as a laugh-line are a give-away. Hipster music. In particular, hipster music used in TV ads. Google Doodle commemorations. The commemoration on June 6, 2012 was the 79th anniversary of the drive-in theater. Most days it is okay to have a plain Google logo on your search engine. Corporate April Fool’s Day jokes. These are no longer cute or unexpected. In order for it to be interesting at this point it would have to end up not actually being a hoax. Your Web site promotion for a printer that “prints live kittens” is only still entertaining if your company actually makes and sells a printer that prints live kittens. Snarky-turned-violently-indignant online opinion articles. Writing does not come off as fresh and edgy just by its using the f-word frequently; it’s played out. The phrase “I see what you did there”. Any image overlaid with words in white Impact font (with black outline). Changing the typeface doesn’t give it new life. I worry that we have become not only technologically stagnant, but also culturally. Here were the ten most popular posts on bkdunn.com in the year 2010, which thereby richly deserve recognition. I’m omitting the counting numbers because it makes the whole blog seem pathetic. US War Deaths by Day by Conflict (War, Battle) and How Iraq Compares – More good SEO-bait in the title, but at least this time it’s sort of a worthwhile article. Gives some perspective and all. Korea was way worse than anyone gives it credit for. More B-52 Photos, By Request (Plus a Couple Pics of AMARG) – SEO-centric title, yep. And, fwiw, the post delivers as promised. The photos look warm. My First Red Egg and Ginger Party – Turns out other non-Chinese people also don’t know what gift is appropriate at one of these (money in a red envelope is the right answer). Getting Closer: My Do-It-Yourself Kitchen Table Project So Far – The title was not written to impress you, it was written to impress an algorithm. Algorithms have no soul (I don’t think). And right now the table is in the garage holding up my compound miter saw. Spooky Gulch, Peek-a-Boo Gulch, and Dry Fork Hike – Yeah, it’s probably a hike everyone should go on in their lifetime (unless they’re claustrophobic or exceptionally wide-hipped). Elwha Valley, Humes Ranch Loop, and Goblin Gate (A Six-Mile Hike) – I’ve posted less-read articles about much more interesting hikes. Goblins Gate is cool, but the rest is a tree prison. Hopefully those that read the post last year now understand as much. Trip to Sequoia and Kings Canyon National Park(s?) – The follow-on post about General Sherman and General Grant was immediately below this one in the rankings, but it’s sort of the same post, so not included. Big trees, much snow, many photos. Well — a *few* photos. Planes of Fame Air Show 2009: Old Planes in the 909 – I went to this air show. It’s a lot better than you’d expect an air show in Chino to be. Many WWII-vintage planes in the air. Gantt Chart for My Home Renovation Project (in Pittsburgh) – Yeah, so I didn’t really keep to the schedule, unfortunately. If I had — just, wow. And for what it’s worth, here were the top five images viewed. These only count if they were viewed as a separate page, which probably only usually happened if they were found through Google or Bing image search. Ford Tri-Motor Interior – It’s a photo of the interior of a Ford Tri-Motor (passenger) airplane located at the Evergreen Aerospace Museum. It’s a nice photo. I’d want to look at it. Gantt Chart – It’s the Gantt Chart from above. Not very photographic, but it gives the appearance of having planned. P-40 Warhawk Flying Tiger – From the same collection as the tri-motor above, only this one has a drip pan! Trigger Finger Splints (1) – Way better than Trigger Finger Splints (2). It shows off my trigger finger splints. Forbes Field Outfield Wall – And now I see this wall *every* *single* *day* (unless I don’t go to school, in which case I don’t see the wall). So now you know and, assuming that knowing remains half the battle, that makes this useful. Shawshank Redemption – Loved it; in my personal top 10. Speaks to the idea of hope without feeling cloying; the characters deserve the ends they get. The Godfather – I just don’t care about gangsters. That said, it’s a very compelling, interesting movie and I have a hard time arguing with its belovedness. The Godfather II – Ibid. The Good, the Bad, and the Ugly – I liked it. It’s not my fourth-favorite movie or anything and the Italian extras trying to play civil war soldiers are, IMHO, unintentionally funny. But I liked it a lot. Eli Wallach ftw. Pulp Fiction – A lot of fun and violence. I should probably watch it again and see if there’s anything more to it than that, but, you know, fun and violence are good either way. Schindler’s List – Overrated, under-interesting. Any PBS or History Channel program on the holocaust is more moving (if perhaps only due to lack of editorial). Little plot, no surprise, and the black-and-white is, I think, just an attempt to make the masses think they’ve watched and comprehended something “arty”. Life Is Beautiful was way better, frex. It had a plot and some emotional resonance. 12 Angry Men – Kind of cool. It’s sort of a small movie, but it’s a good lesson about how a group of people who are foolish in the first place can easily get brow-beaten by Henry Fonda. Wait — that *was* the message, right? One Flew Over the Cuckoo’s Nest – Kind of boring. Not much happened. Didn’t see any reason to care about any of the characters. Now what? Death Valley: visited! Went last November and took photos. Y’know, I didn’t think it was all that amazing when I was there, but some of those pictures make it look dang pretty. 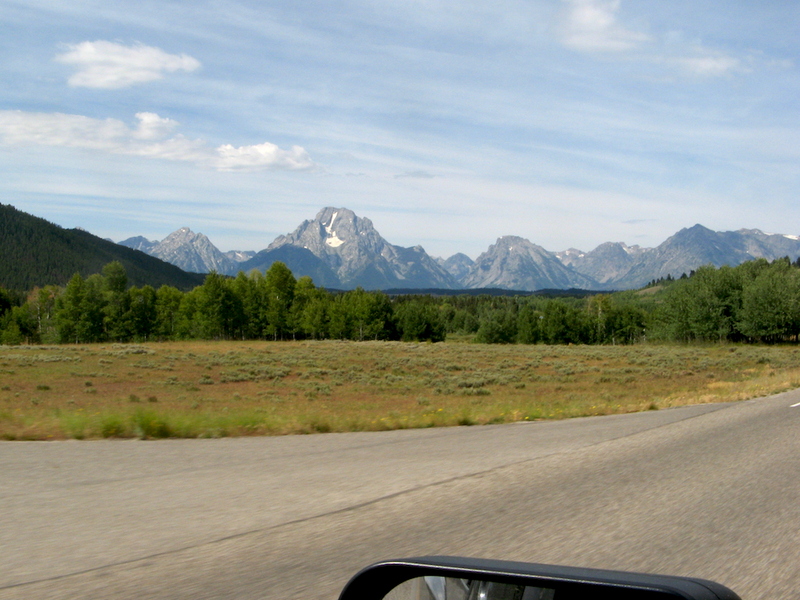 Grand Teton: visited! Another one I should probably go back to in order to actually explore. The family reunion we had there didn’t involve much of the park. Great Smoky Mountains: not visited. Hawaii Volcanoes: not visited. Ibid. Mt. Rainier: visited! Many times, but most recently evidenced here. Olympic: visited! Some day I want to go when it isn’t fogged over, though. And I should probably go to the beach and rain forest side of it one of these days. Yellowstone: visited! I was a kid, though, so mostly I remember the smell of sulfur and a geyser. If I ever get around to the 48-state trip, I should be able to knock a bunch of these off the list. And then I’ll have to do that driving trip up to and through Alaska. Then I can die. I mean, eventually.